Saturation can do all kinds of different things to bass parts. A bass sound's fundamental frequency provides sub weight, but higher harmonics strongly reinforce the perception of bass, giving it presence in the mix on smaller playback systems. Saturation and distortion treatments can help add mid-range to cleaner bass parts, but you can only drive things so far before the addition of new harmonics alters the original timbre too much, removing low weight and power. Get around this by pushing a high-passed duplicate of your clean bass into a drive stage, then blending it in the mix with EQ and dynamic control. Subtle saturation will lightly thicken out your bass weight, while grungier distortion will add real character. For a unique effect, combine two or three distortion treatments, then spend time adjusting the settings to taste. For much more on distortion and saturation, get your mitts on Issue 285 of Future Music, which is on sale now. Step 1: A synthesized 808 kick drum can act as both kick and bass in an urban-style groove. It's powerful and weighty but lacks mid-range punch and harmonics. Saturation would add this, but we can only saturate it so much before it loses its deep timbre and weight. Step 2: Process a second copy of the kick/bass part. 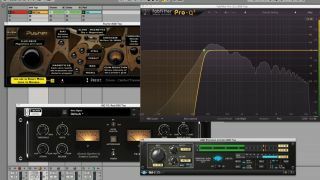 A saturation plugin and driven compressor introduce upper harmonics, then a high-pass filter and limiter shape this distorted layer's tone and dynamics. Low-pass the lower kick to make room for the new upper layer. Step 3: The bass layers could now be grouped and gelled together with more saturation, but instead we apply lots of tape saturation over the entire master channel. Notice how the hi-hats are crunched up as each bass note hits. We've taken this effect to extremes to illustrate it.